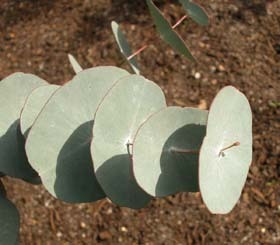 Eucalyptus perinniana (Spinning Gum) is a rare, distinctive mallee-form eucalypt that in Tasmania only grows on seasonally waterlogged areas on sandstone in the south-east (it also occurs in the snow country of Victoria and NSW). 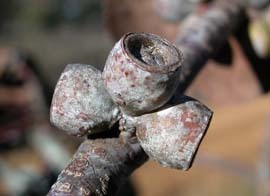 Its distinctive features are the very glaucous, sessile, opposite leaves which are fused around the stem. 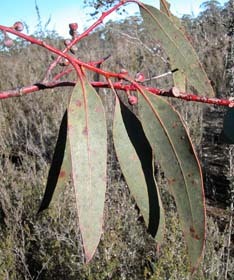 The only other species with the leaves fused around the stem is E. risdonii and juvenile leaves of E. tenuiramis, but the tips of the leaves of those species are pointed, whereas E. perinniana has blunt juvenile leaves. 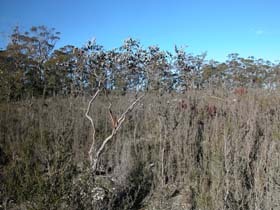 It flowers while still with juvenile leaves and rarely has adult leaves in the wild.